Many adults only find out late in life they have some of these things, in the case of my characters it is true for one or two. Sometimes people with long term illness too, have never been diagnosed. In life some are very open with diagnosis and some are not and I wanted to reflect reality – it’s not always a main focus for conversation with people who have these things. In the books I did not want to make the story about what varied issues these characters had, instead i wanted all of them to just be ‘people’ and not ‘conditions’. Readers with some of these conditions relate more to the ones they see traits in and I like that it leaves them wondering if they are or are not. A sense of connection. Like a secret they uncovered. I know a lot of readers form an opinion as soon as you mention a disorder or difference in a character, and it changes the whole tone of what they are reading. Still today its a barrier for some uneducated folks and I was fully aware of that. I didn’t want that. I wanted them to read about people and see no difference, and not even be aware of it. A lot do not realise that it doesn’t change the fact that we are all just people and we still have a lot in common. I made the traits blend into the story, because that is the truth of people who have them. Some are so un-obvious to other people that they would not know without being told directly they even had a disorder. And yes….I have some myself. I love that you brought a gay character into the books, will there be more? Yes. I wanted to start bringing diversity into the books as I am a pretty accepting person, but did not want to flood the books with a million ‘messages’. I have plans for more varied characters. Not just based on sexuality. I want my characters to have their own space to shine so will litter them sporadically. I get that Carrero’s underlying message is about abuse…so far female only. Are there going to be any male awareness plot-lines? Yes. I have male characters in the Hunstberger family who have their own scars and in the future planned books, we delve a little into the reality of male abuse. I aim to always treat the topic with a gentle hand as I do not want it to become the story, just contribute a little. Why do you base Carrero stories in abuse? It’s personal. I have known what it’s like to be that silent voice on the darker side. It was a way of healing myself and then it became empowering. I wanted people to see that not all victims of abuse remain so visually scarred that they cannot go on to have a normal life. Some of us are survivors and fighters. Some of us find strength in what happened and I wanted to show those characters in a gentle light. Once the mould was set, it just evolved naturally and now I do not even think twice about an abuse basis for the plots. I could not relate to Emma – I felt she just acted in a non realistic way. Unless you have walked in the shoes of a persons path and encountered or endured all they have , then you cannot say what you would do if you were them. You may not relate or agree with what she says or does, but a lot of people do – people who have walked her path too. We are all different. We all grow and behave differently and you need to remember that her past has altered what a non abused person would do in the same situation. I like psychology in my books and I do not ever just make a character do anything that does not connect to the life they have had. Emma is Emma. You do not need to relate or agree with what she does or how she is to empathise and love her story. The point of my books are to show you how someone who is surviving may behave or react. From the experience of those who have done it. I have a sense of hints of feminism in your books. Is that intentional? Yes and no. I am not what I would call a feminist, I feel that term nowadays no longer reflects what it means and I do not like labels anyway. I am a girl who was never held down by a gender boundary and my characters are of the same mind. They want to live their lives, making themselves happy in any way. If that is being a stay home mother, or a independent businesswoman then that is okay, either way. It’s about making yourself happy in what you do, wear and chase. Gender doesn’t affect any of my choices in life and when I have chased male orientated goals I was never deterred. If a girl loves heels, make up and aims for motherhood and the home life, then that is her choice too. No one should make judgements on what makes another woman happy. I maintain that in the books and give my characters the ending that makes them happy and not what is expected in romance novels. My male leads are people who treat their women as equals, who respect them and understand that ‘woman’ does not mean ‘inferior’ or incapable. The contrary infact. The Carrero men are bowled over by the strength and determination in the women they fall for. They choose ‘partners’ in life and not women they have to shelter, even though they are very protective. Happy endings are a personal thing. As my mother told me once – there are many paths to happy ever after and you should forge your own. 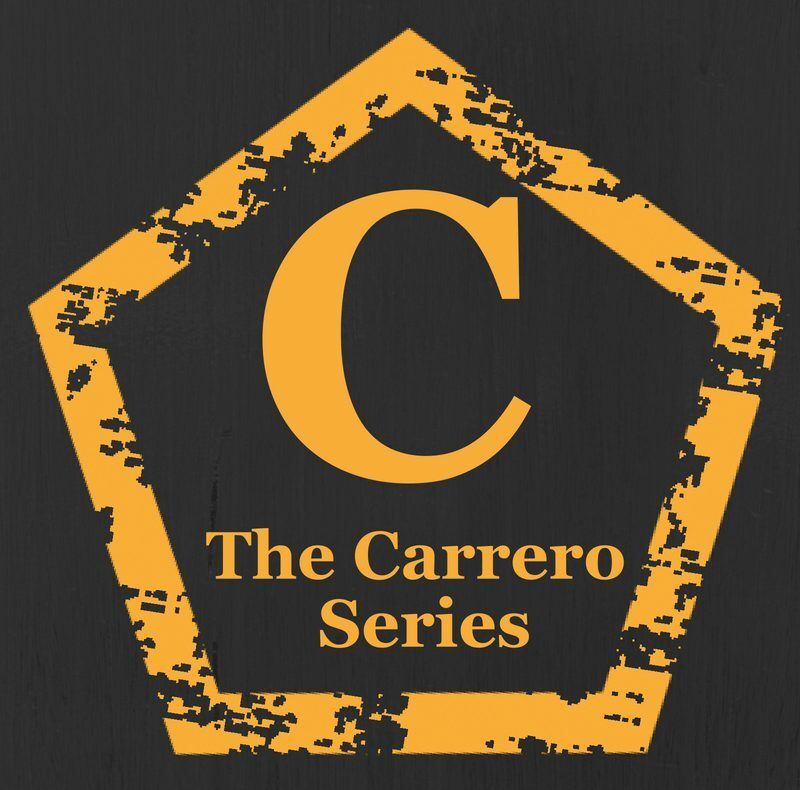 The Carrero effect – start a story that keeps you glued to a series…. I am so grateful for the way you weave issues into your stories without using labels to distance the reader from them. We ALL have issues, and the most poignant stories show people dealing with their issues – or not – and struggling to grow, to heal, to become happier, healthier human beings. I really appreciate your light touch as well as the poignance of your stories. Thank you.